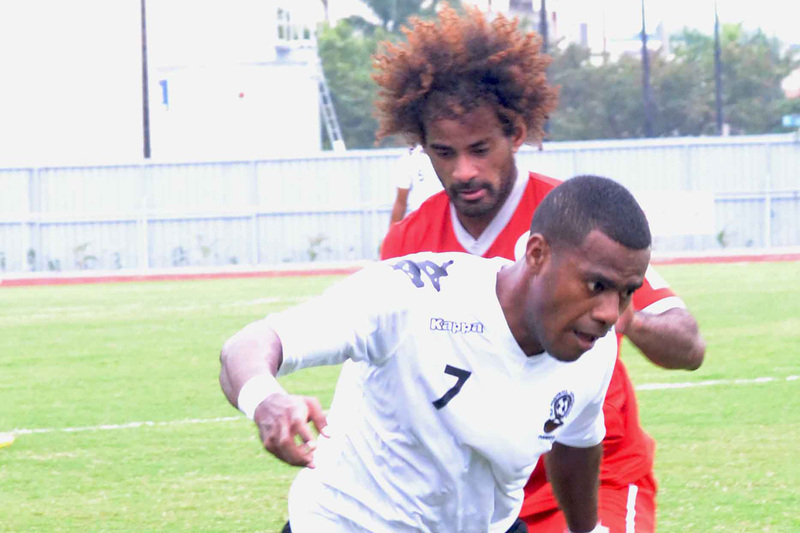 New Caledonia and Fiji will meet for their second leg at Stade Numa Daly in Noumea on Sunday. After a neck-and-neck battle ended with a 2-2 result in their first leg, both Fiji and New Caledonia are eager to secure a first win in the 2018 FIFA World Cup Russia™ Qualifiers – OFC Stage 3 when they meet for their second leg at Stade Numa Daly on Sunday. New Caledonia have the advantage heading into the game, with a one-point lead on the table over Fiji after their draw against New Zealand, and the added support of the crowd in Noumea. In their last encounter the combinations between eager newcomers and experienced senior players earned the Francophones an early 2-0 lead, but the exit of defender Emile Bearune after two yellow cards left the team battling a full-strength Fijian squad with 10 men. New Caledonia will be without Bearune for the second leg – serving a one-match suspension – but with a number of talented players waiting for the call up to Les Cagous, coach Thierry Sardo believes his side has more than enough depth to challenge Fiji. “In this next game, we hope to win,” he said. “We have a player who will be suspended but we’ll pick up some others who stayed in Noumea and hopefully they’ll bring us something extra to help us win the match. After his side’s spectacular comeback, Fiji coach Christophe Gamel is keeping his feet on the ground as he prepares his side for their second match against a team that has proven their ability to find the net. “We can be confident after our last game, making a comeback and playing the type of game we did, and we have one point which is good for our mentality. We know we are a good team,” he said. “We are improving but they are a tough team. We have to be confident of course but not over-confident. This is the problem sometimes, we get one or two good results and everyone celebrates. The challenge will be even greater for the Fijians in the second leg, Gamel believes, as the young side will have to overcome their early nerves – which nearly cost them the last game – on foreign soil. “It will be a big challenge because it will be in the evening on Sunday so everyone will come to the game,” he said. Vital Statistics: New Caledonia impressed spectators at Stade Yoshida in Kone during their last FIFA World Cup Russia™ Qualifier – OFC Stage 3 home game, keeping regional front-runners New Zealand at bay for 90 minutes to earn a 0-0 draw. Although their Fiji encounter will be played further south at Stade Numa Daly in Noumea, New Caledonia will be hopeful of claiming another impressive result on home soil. The Players: National team debutant Mone Wamowe was the star of the show in first leg, beating the Fijian backline to two excellent crosses and sending both past goalkeeper Tevita Koroi to take the lead in the first 25 minutes. The 30-year-old’s positioning up front – and his accuracy in the air and on the ground – makes him difficult to mark and dangerous in front of goal. New Caledonia: 20. Thomas SCHMIDT (GK), 2. Romaric WALONE, 3. Iler HNAUK, 4. Pierre KAUMA, 5. Jeremie DOKUNENGO, 6. Geordy GONY, 7. Joel WAKANUMUNE, 8. Jacques WAMYTAN, 10. Shene WELEPANE, 11. Mone WAMOWE, 12. Richard SELE, 14. Didier SIMANE, 15. Joseph ATHALE, 16. Cedrick SANSOT, 17. Willy WAIA, 21. Emile OUNEI, 22. Roy KAYARA, 23. Mickael ULILE. Vital Statistics: With only one point on the table for Group A after Wednesday’s draw with New Caledonia, Fiji will need a win to edge ahead of their Francophone opponents and finish runners-up in their group. The Players: Goalkeeper Tevita Koroi had an impressive performance in the first leg of Fiji and New Caledonia’s Stage 3 encounters, only conceding two very impressive goals. The 23-year-old’s quick hands kept the margin between the two teams tight enough for Fiji to make their comeback, and his calmness with the ball at his feet made him a useful member of the backline in possession. Fiji:1. Tevita KOROI (GK), 2. Vuniuci TIKOMAIMEREKE, 3. Kavaia RAWAQA, 4. Kolinio SIVOKI, 5. Remueru TEKIATE, 6. Amani VALEBALAVU, 7. Epeli SAUKURU, 8. Christopher WASASALA, 9. Setareki HUGHES, 10. Dave RADRIGAI, 11. Waisake TABUCAVA, 12. Saula WAQA, 13. Sitiveni CAVUILAGI, 14. Laitia TUILAU, 15. Samuela KAUTOGA, 16. Laisenia NAIOKO, 17. Iosefo VEREVOU, 18. Madhwan GOUNDER, 21. Roy KRISHNA, 22. Beniamino MATEINAQARA (GK).